I was grateful to be invited to the 2nd Annual Christmas Tree Decorating Party hosted by a dear friend of mine. I’m not sure how official this event is but the 2nd anniversary it is! Yes this took place on a Saturday, hence the cheesy title. This one, even more so, is truly about the experience. This crew is fun. So you know good food and hopefully good wine is going to be incorporated. The wine purchased was a 2014 Cotes du Rhone Rouge Acantalys, from Chesapeake Wine Company in Baltimore, MD. A thanks to them for the suggestion. I really liked it. The label looked like some red wrapping paper so that helped. I specifically asked the owner if they had had any holiday themed bottles or labels for this party. They did not, so I simply asked if they had a decently priced wine with some pepper or spices. And voila. This is exactly what I was looking for. It had elements of pepper, spice, and barbecue smoke. This was an enjoyable bottle for only $12. But more importantly, this was shared by all of us as we slowly adorned the tree with ornaments. This is a special time of year and some of can get overly sentimental. Some of us need an event like this to finally get us over the hump and into the spirit. I’m somewhere all over the place. I can never involve myself in enough things with the intent of feeling good. This was needed by everybody. A friend brought homemade cupcakes which paired well with the spicy wine. I’d say the dichotomy of the flavors really made the wine and the cupcake a unique but successful duo. You know when there’s a party, pizza has to be involved. And my friend ordered a buffalo chicken pie to be shared. It was annihilated within minutes. Here’s my one slice. Nothing could have messed this up. Even if the food or wine wasn’t up-to-par, we would have figured something out. Luckily, everything tasted great. I suspect the festive occasion made everything taste and feel better regardless. With a heightened sense of spirit, our palates and our energy may have been altered a bit, for the best. And I say that with all positive intent. It’s events like these that make me feel such joy and love. I wish the feeling could hit me everyday. Actually it can. The holidays are a special part of the calendar year that would lose it’s uniqueness if celebrate too long. But that doesn’t mean we can’t feel good all the time. Small gathering like this remind me that I can and I intend to. Good wine and good food will only increase those good times. Good friends and family to share it with, not only enhances that but also gives us a feeling of comfort and love. We are well into the holidays and want to take every second to savor it I can. This is why these blog posts exist. And speaking of savoring, Chesapeake Wine Company has apparently been sold. What will come of it? I don’t know. But this place has been so good to me, especially on Sundays. As one of the few places with a seven-day liquor license, it has been a go-to for so many. So keep that in mind if you’re in the area and doing shopping over the weekend. In the meantime I’m going to appreciate the work we did on the tree. Before and after pictures have been included. Enjoy the holidays and enjoy them with people you care about! 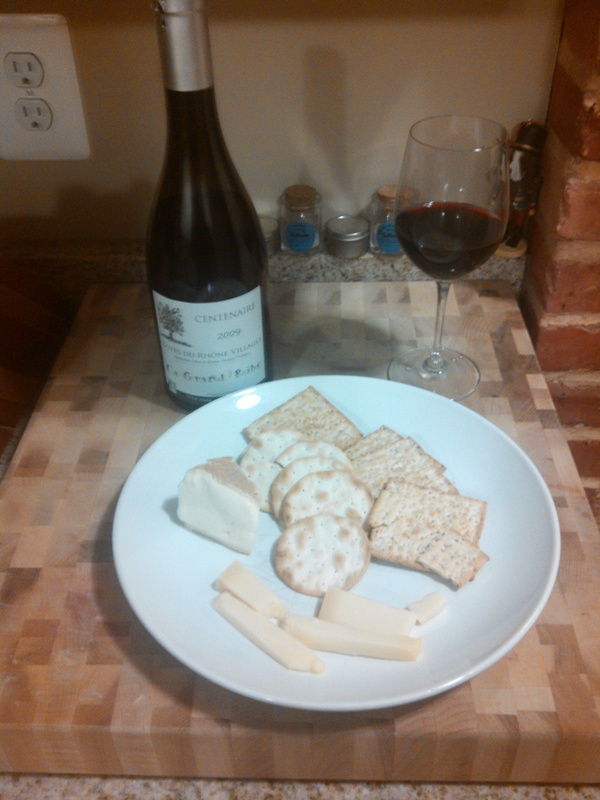 I got to try a new Cotes Du Rhone, per a recommendation from a friend. And I am so happy I did. It’s a full bodied red at it’s finest. I thought it was a bottle that I had before. But I doubt it. This flavor would have resonated with me. Is it the peppery taste that makes me love Cabernet Franc so much or are there some exciting things going on here? Now I have always like a good Rhone, Grenache has always been a favorite for me. 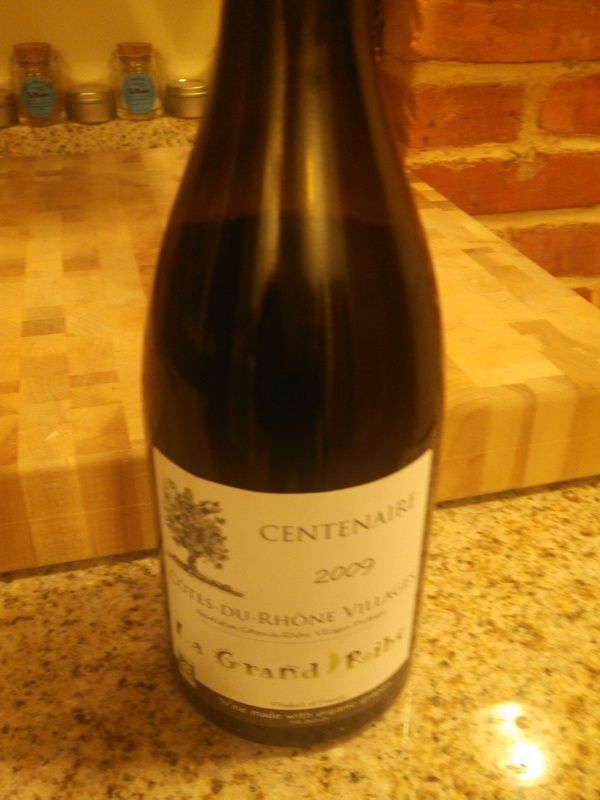 The La Grande Ribe Cuvee Centenairee Cotes Du Rhone 2009 is one for the books. As soon as I took a whiff upon opening, I knew I was in for something different and something special. Boy was that an understatement. There was a smokiness, along with something else very distinct about the aroma. So I took a pour and this blew my taste buds away. I thought I was tasting a piney, earthy, or maybe out of this world selection. Well I looked up what I could and discovered that barbecue smoke and roasted herbs are added to make this a dynamite bottle. Literally. Mystery is abound, however, as I cannot find anything about the winery itself. But to my pleasure and lack of surprise, you can look this wine up and get a dozen or so different synopsis and evaluation of what is included. It’s all about interpretation and the power of persuasion. But I definitely can taste the smoke and the herbs. Or is it something else too good for words? Bottom line, this is an awesome get. And this is how I enjoyed it.